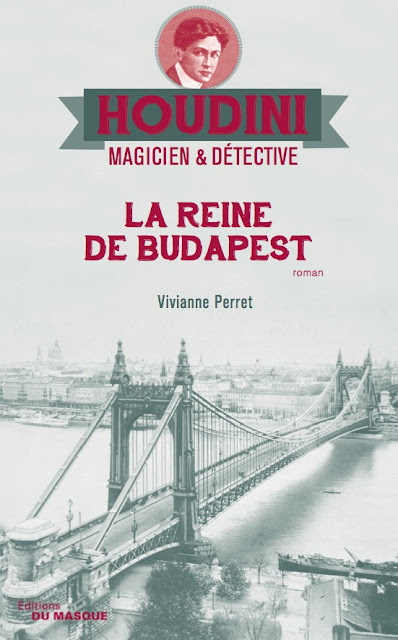 The third book in Vivianne Perret's French language "Houdini Magicien & Détective" series, La Reine de Budapest ("The Queen of Budapest"), is due for release on October 4, 2017. It can be pre-ordered now at the French Amazon.fr. Amazon does not yet have cover art, but I do! While these adventures are fiction, author Vivianne Perret sets each book in a historically accurate time and place. Her first book, Metamorphosis, was set in San Fransisco in 1899. The second, Le Kaiser Et Le Roi Des Menottes ("The Kaiser and the King of Handcuffs"), found Houdini in Berlin in 1900. As you can tell by the title, this latest adventure has him in Budapest, which Houdini visited during his first tour of Europe. Vivianne has shared with me the location for book 4 (hint: we've spent time there lately), but I will save that news for another time.